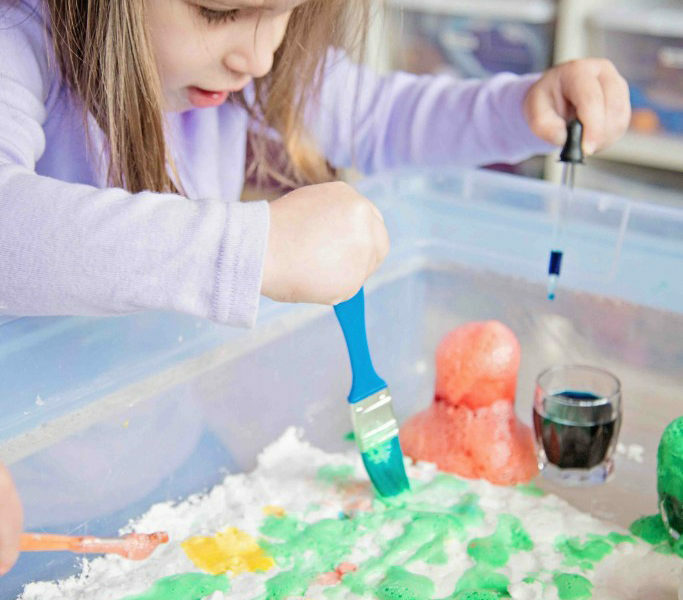 I’m super excited to share this Fizzy Snow Dough painting activity we did this morning, it combines the best of science, art and sensory play in to one activity! We had so much fun painting, molding, and exploding this dough, I can’t rave about it enough! 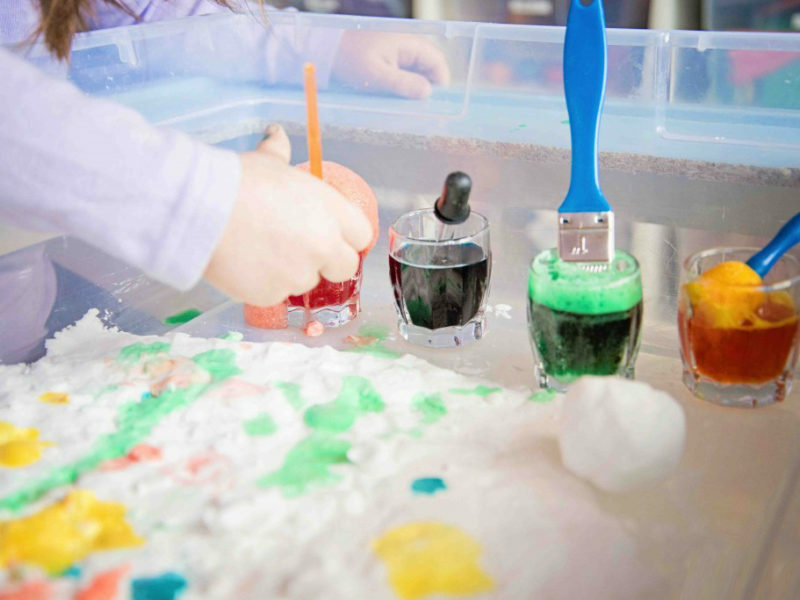 We began with a simple recipe for faux snow, a two ingredient sensory dough, and added a little bit of chemical reaction magic to it! Quite awhile ago, I stumbled across this erupting snow recipe from Growing a Jeweled Rose and thought it would be fun to do when we got around to it. I’m glad we finally made the time, because it is so simple and awesome! Just dump and mix the two ingredients as you go, it doesn’t take a full can of shaving cream, so when you reach the right consistency then go ahead and stop. 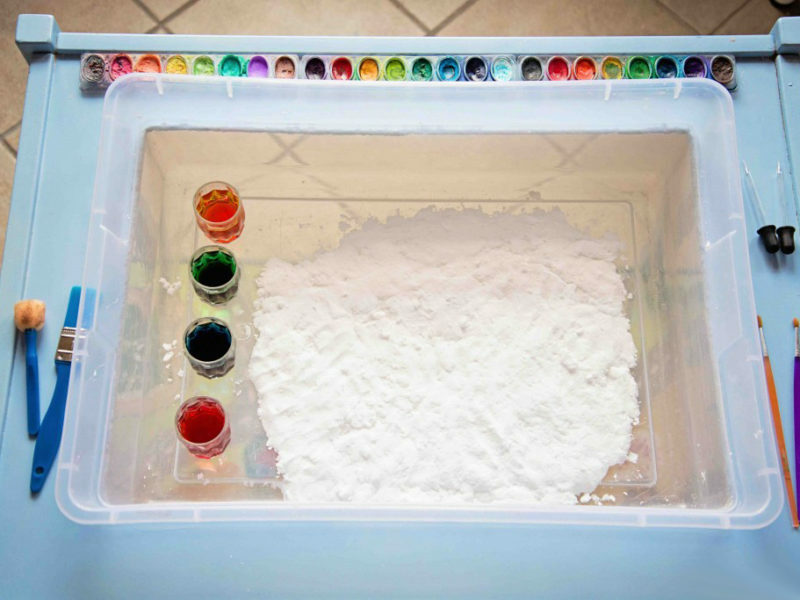 I added some colored vinegar to this activity so that the kids could paint. We flattened our dough in to a nice canvas and set to work exploring the fizzy paints! It was a huge hit! 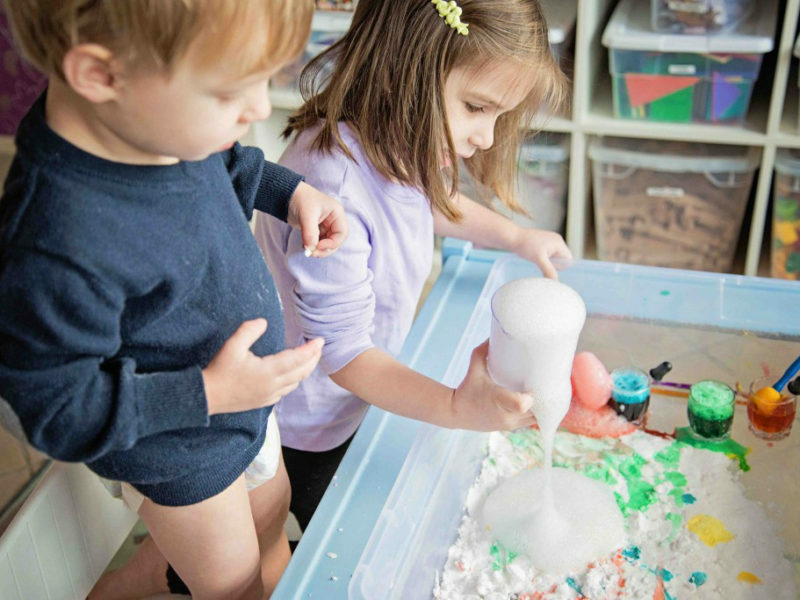 They loved how their drops and splashes bubbled up in colorful eruptions. This was a great opportunity for me to work in color theory with them too. Gray is working on mastering the names of the colors, and Aurora is learning about primary and secondary colors. We talked about chemical reactions, how when two different reactants are combined they turn in to something new, and sometimes during this change cool things can happen. They can get hotter or colder, can change color, explode or fizz! I tried to keep the explanation as simple as possible, not easy when you’re talking about serious science to a not-quite-four-year-old! Did I mention that this dough is great for molding? 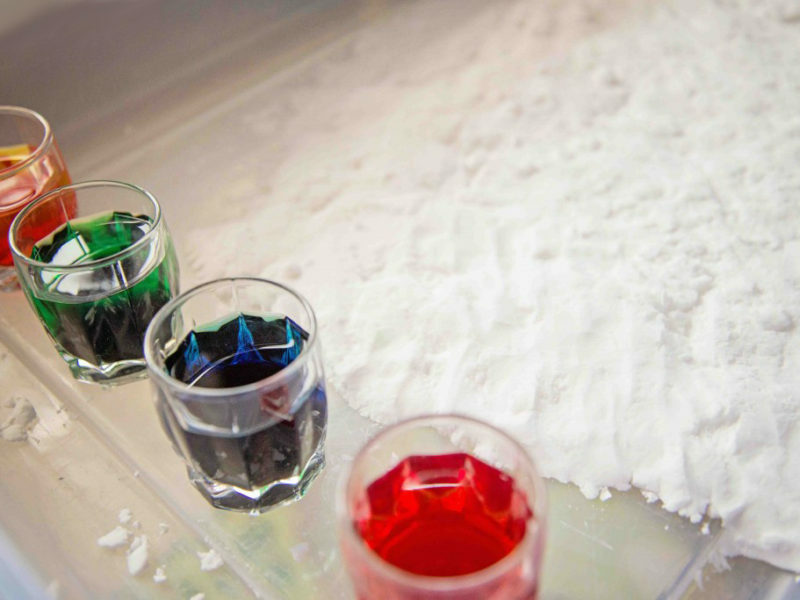 You could make a volcano, snow balls, or anything really! 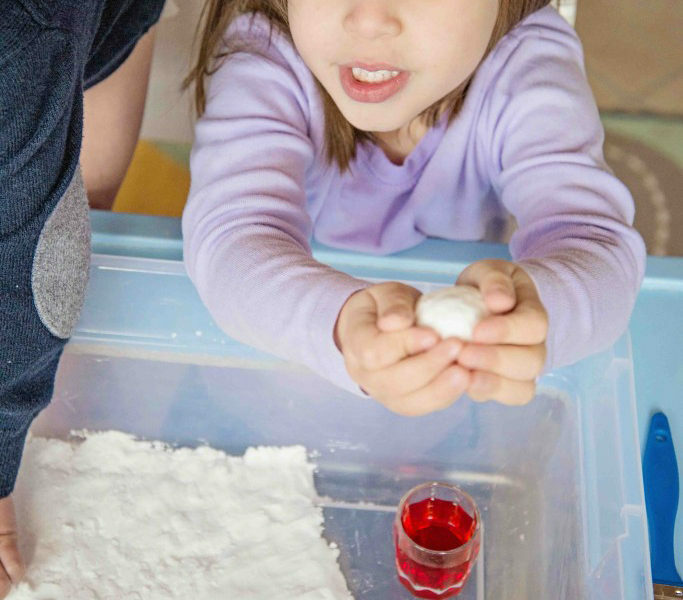 We made up some snow balls and then plunked them in to a beaker of vinegar! Fizzy magic overload! They especially loved this! Eventually all of the contents were poured together and turned in to an artistic soup… I still think it looks pretty though! They played with this for hours, when the top player of snow dough was all painted and fizzed out we scraped it off and decorated the layer underneath. 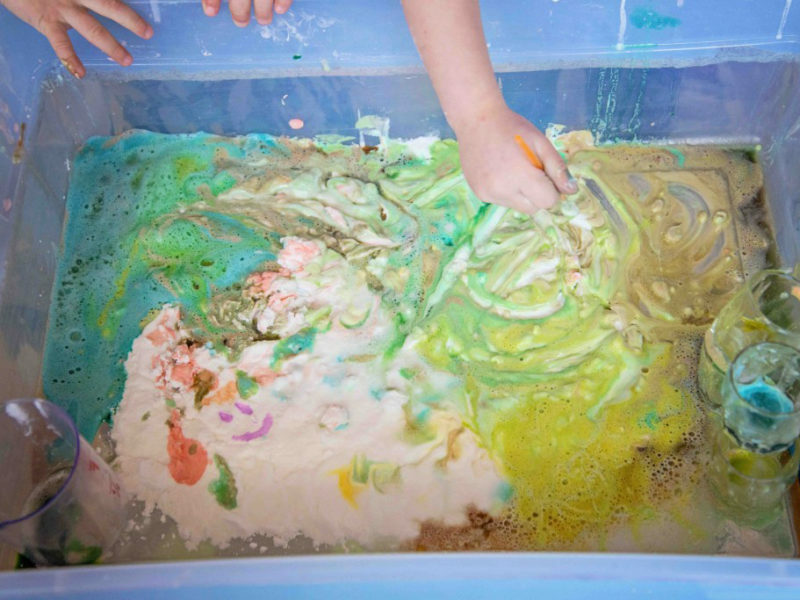 This was definitely one of my favorite activities for longevity, both kids had to be pried away from the sensory bin when lunch time rolled around. I don’t know about you, but that’s my kind of activity!